EcoPouch contains VpCI-609 powder for corrosion protection of ferrous metals and aluminum. The pouches are constructed from breathable Tyvek®, which allows the VpCI molecules to be emitted through the membrane, and form a molecular layer on metal surfaces providing corrosion protection. EcoPouch is easy to use: there are no chemical concentrations to calculate and no need for special equipment for application; just determine the number of pouches required per unit space. EcoPouch provides a clean method for corrosion protection. 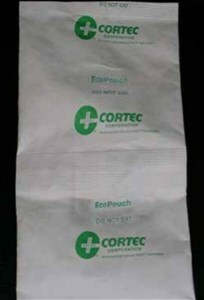 EcoPouch is available as individually cut pouches, and each pouch protects up to 35 cubic feet. Determine the number of pouches required based upon the volume of space needing protection. Each pouch protectes up to 1 cubic meter (35 cubic feet). Evenly distribute pouches throughout the space and close or seal. Do not use on copper, copper-based alloys, and other soft yellow metals. Compatibility with non-metallics should be evaluated. EcoPouches are available as 50 units per carton. Do not store in conditions about 150 degrees F (65 degrees C). Close cartons between uses. The shelf life of unopened cartons of EcoPouches is up to 24 months.